The Broderick Building towers over Grand Circus Park. 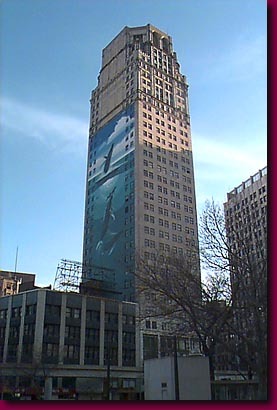 The Broderick Tower stands empty today. As there is recent talk of developing a loft community using the numerous vacant buildings in the Woodward and Grand Circus Park area, there is talk of its conversion into loft space. It remains to be seen if this is not merely gesture or speculation as is often the case when the time for the money to appear arrives.